The Wrong Ghost Ship on Long Rock Beach? If you search the Internet for pictures of the Jeune Hortense you'll find several showing a ship driven aground at Long Rock, sails still set and broadside to the seas. You'll also find several which show the remains of a keel, exposed by storms and looking like the same location at Long Rock. This exposed skeleton is undoubtedly the remains of a wreck but it seems unlikely that the wreck is the Jeune Hortense. The crew of the Jeune Hortense being brough ashore by the lifeboat Dora whose carriage is in the foreground. St Michaels Mount in the background. Picture by Alexander Gibson courtesy of the Morrab Photo Archive. 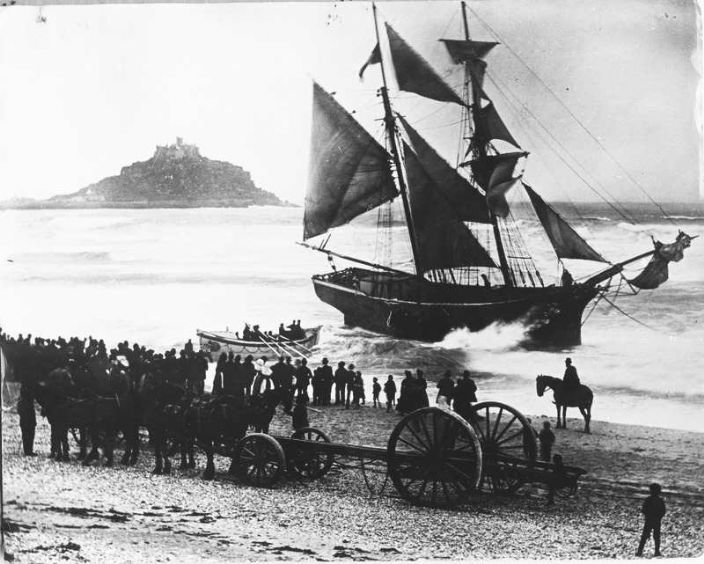 The ship evidently sat on the sand for a short while and the Cornish Telegraph of 24 May reported that the members of the Penzance Natural History and Antiquarian Society, on their monthly excursion on Friday 19 May, made a special diversion from the visit to Ludgvan in order to inspect the wreck. For wreck she appeared to be: several newspapers carrying intelligence from Lloyds that she was “likely to become a wreck”. (eg Sunderland Echo 19/5/1888 and South Wales Echo 18/5/1888). On 31 May the Cornish Telegraph reported that Jeune Hortense was auctioned and purchased for £30 by Mr J.H. Bennett. Some days later, on Saturday 26 May, the schooner was re-floated without the aid of a tug and anchored in the bay before being brought in Penzance harbour on Monday 28 May for examination. The examination evidently concluded that Jeune Hortense was beyond saving as the Cornish Telegraph of 23 August 1888 reported that she was being broken up in Major Mathews' dry dock. So, it all seems pretty cut and dried except for the fact that a ship which had been re-floated, taken back to Penzance and subsequently broken up in the dry dock is unlikely to have left her keel lying in the sand at Long Rock. One of the modern accounts of the loss of the Jeune Hortense (Cornwalllive 15/7/2010) also says that she was carrying 450 head of cattle which were got off onto the beach but the vessel could not be re-floated and was broken up as firewood, presumably where she lay. Cornwalllive is the website of the Cornishman, the newspaper which carried the most detailed account of the wreck of the Jeune Hortense, the original account made no mention of cattle and it's unlikely that 450 cattle could be squeezed into the hold of a small 91 ton schooner. Certainly there is no mention in the press of 450 cattle suddenly coming ashore at Penzance at any point during 1888. The remains on Long Rock are almost certainly not the Jeune Hortense, perhaps the Petrellen which ran ashore in the same location in 1885. And what of the cattle? A mystery waiting to be solved. The story of the exposure of the 122 year old Jeune Hortense on Long Rock beach made the national press, both the Daily Mirror and the Daily Mail carrying the story of the “ghost ship”. Never let the facts get in the way of a good story! Gibson Family. John & sons Alexander and Henry, “Shipwreck the "Jeune Hortense",” Morrab Library Photographic Archive, accessed May 2, 2017, http://photoarchive.morrablibrary.org.uk/items/show/14189. The body landed at Penzance was, according to the Royal Cornwall Gazette 24 May 1888, Mr Tom Hall, a native of Penzance who was indeed a telegraph clerk who worked for the Eastern Telegraph Company in Brest, where he had died of consumption. According the RCG, Jeune Hortense was bound for Fowey and had arrived in Penzance on the 16th, the evening previous to her wreck.